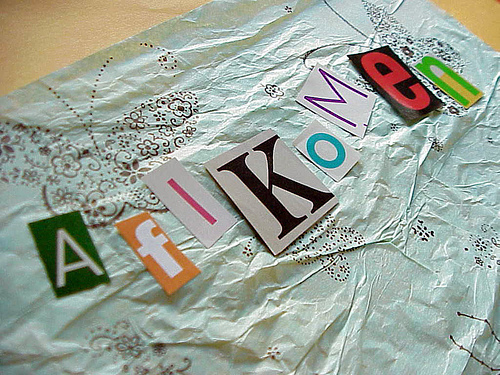 If you have less time and/or supplies, here's an Afikomen envelope project that you can do with what you have on hand! Lay out your supplies and have your wee ones go on an alphabet treasure hunt! 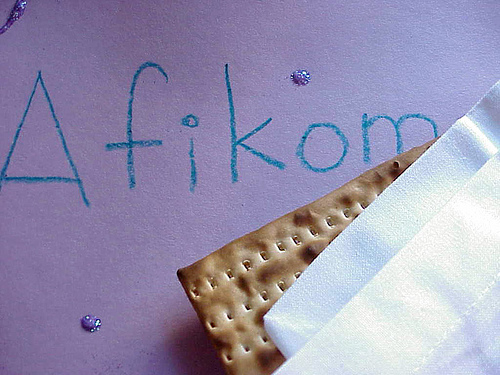 Write out the letters that spell AFIKOMEN on a sheet of paper. Pass out the scissors and magazines and let them have a go at it! 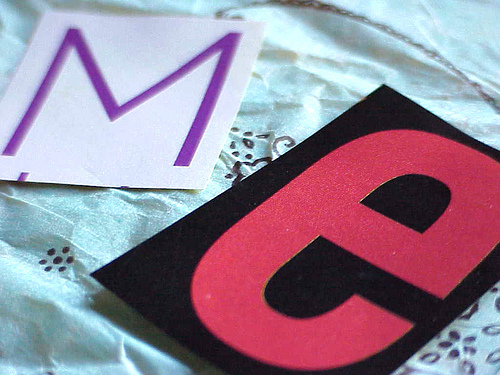 Once they have cut their letters out they can arrange them on their envelope and glue when ready. They can then add any other razzle dazzle they like. Viola! 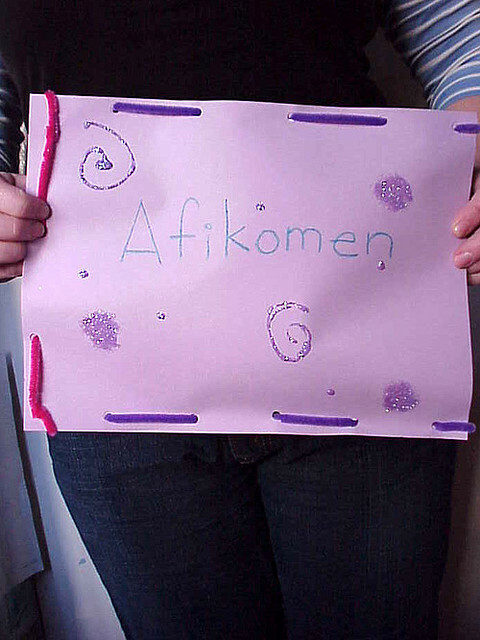 A custom made Afikomen envelope! The cool thing about this project is utilizing your wee ones hand eye coordination, small motor skills and letter recognition! Don't need to stop at Afikomen. Kidlets can make their very own artists portfolio and hunt out the letters to their name to glue to the front! Kidlets who can recognize letters if not read them can do this also! They will love it and it will give you at least 20 minutes of "you" time! Don't forget to add your pictures to scrumdilly-did! 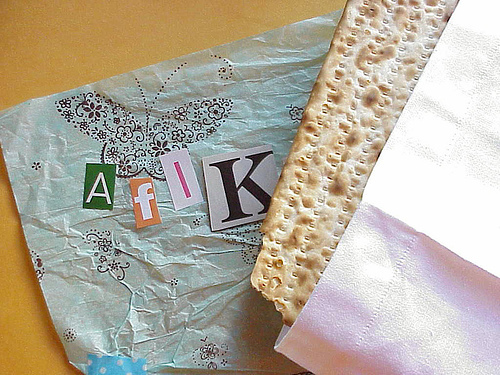 Okay, not yet but soon and what better way to protect that piece o' Matzoh than to make a super special envelope/bag for it? I have two styles in the works for you and hope you can use them as a jumping off point for your kidlets. Paper is perfect for the younger kids while sewing would be grand for the older (loose weave burlap can be stitched with a plastic needle!) or perhaps, they can decorate a piece of fabric and you stitch it all together for them. Afikomen envie number one is made from two sheets of construction paper. You can use any kind of paper you want but this is what I had on hand. It is super easy, can be made quickly and your wee ones will have a glorious time glue glue glueing all kinds of extra bling to their envie. This project allows for creativity, lettering & language skills and small motor skills as they weave their "binding" in and out of the holes they have punched. Good practice for all that hand eye coordination. *extra bits and baubles like glitter, jewels, scrap paper, tissue, etc. Holding the 2 sheets of paper together have your kidlet punch holes around three sides. Using yarn or a pipe cleaner, your kidlet can then weave in and out of the holes to seal the edges together. I used a pipe cleaner for each side which was super easy to just twist off. Now your wee ones can decorate to their hearts' content. 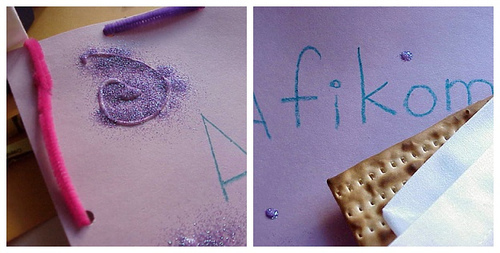 Have them write out the word AFIKOMEN to practice their lettering and all that fun literacy stuff. Set aside to dry. On the big day, wrap the Afikomen in a cloth or napkin and slip inside the envie and hide. Viola! No crumbs behind those drapes! 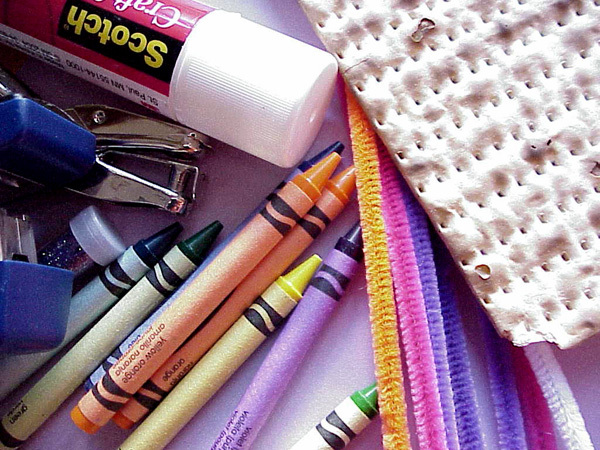 More Passover stuff can be found on my Kaboodle list. Plague finger puppets anyone? Or rather...decorate a cup! To keep your wee ones busy before Seder time, why not have them decorate their very kiddush cups? You can use any type of plastic cup of your choosing, they come in so many styles. This way you can either go the goblet route or the tumbler route. Me, I went for what was easiest to find. Introducing my kiddush cup! It is still a little sticky from all the glue but it will dry pretty soon. These cups are pretty much good for one use only so have yer wee ones make a bunch! 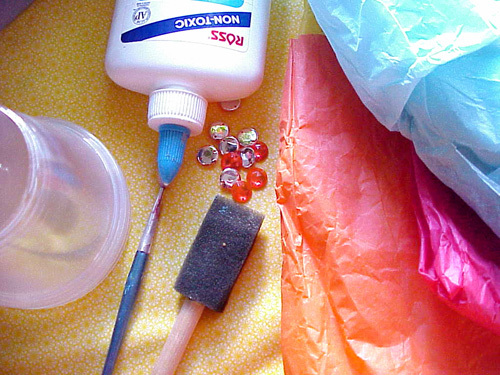 Gather your supplies and set up shop in a glue friendly are. Use a splat mat if you are overprotective of your furniture. Kidlets can get very creative with glue and you never know hwere it will end up! 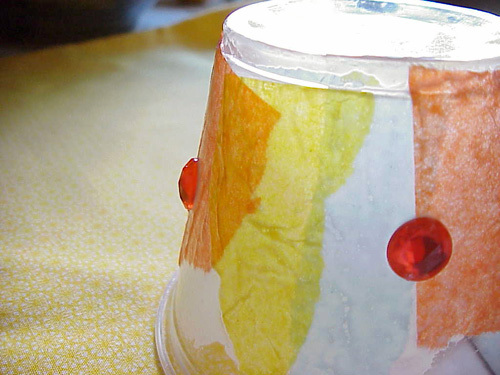 Have your wee ones tear up pieces of tissue paper to have ready for when their cups are all sticky with glue. Get ready to bedazzle! There are many ways a kidlet can go about doing this and I would encourage you to let them do it their way. They can "paint" their cups with glue first using a sponge tip brush to cover more are in a single swoop or they can hold the tissue over the cup and paint the glue over the paper, either way works, yay! 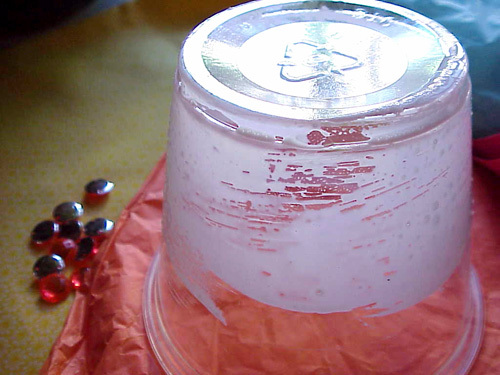 Once the tissue is all over the place, your kidlets can add other bling to their cups using stickers or plastic jewels. Once they are done set cups aside to dry and then behold their magnificence! See? Super easy and fun to make! Share pictures of your cups over at scrumdilly-did! Thanks! More scrumdilly-do pics can be found here and more Passover fun can be found here. Passover Candy, originally uploaded by pixelchick. Being that tomorrow is Puppy Day according to whomever it was who really likes puppies, I have compiled both a kaboodle list of fun and a listmania list of doggone good reads for you. I know that there are a great many dog books that aren't on the list but the ones I listed are some of my favorites! Please check them out and try to find them at your local library! For now, here are two of my top faves for funny looking doggie reads. Both are about funny looking dogs and both will delight your wee ones i'm sure of it! While Unlovable is a prettier looking book, give Uglypus a chance. He becomes a hero and a true friend to a boy who couldn't appreciate him in the begining. It's all about not judging one's beauty from the outside. Start your own book club! This may be old hat to some of you but just in case I thought I would point y'all to Target's Ready! Sit! Read! book club organizer and generator. It's pretty cool plus you get this nifty backpack and extra goodies designed by J. Otto Seibold of Mr. Lunch fame. The cool thing about Ready! Sit! Read! is that you can print out all sorts of templates for journal pages and lists to help you out. Of course you don't HAVE to do any of that but it's a great jumping off point. You may also want to try your local library or bookstore to see what type of book clubs and storytime programs they offer. Lookie these goodies I recently received. Bookmarks, stickers and pamphlets...oh my! So, check out Target's Ready! Sit! Read! and create your very own official bookclub. You can't lose! Books are a wonder! Please feel free to ask me for reading recommendations. I have so much info in my head I don't know where to start sharing! Spaghetti Book club by kids, for kids! Making GREEN with shaving cream! 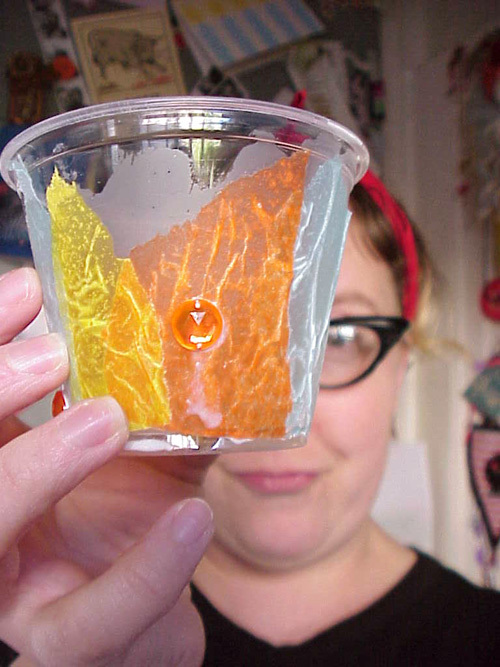 Have a blast with this fun science-y activity of color mixing! It can be goopy messy so make sure yer kidlets appreciate a mess and wear not so special clothing. This is best done outside and is perfect for warm weather when you can bring out the hose or squirt bottles for clean up! If you can't do it outside, keep your mixing masterpieces in their plastic baggies and at the kitchen or play table or have your wee ones each use their own cookie sheet or tray. Shaving cream on its own is easily cleaned up. Shaving cream with color may stain so be sure you want to do all this before you start and remember, a little goes a long way! click here to see a larger version of the picture! *Add a drop or two of the two colors, one color on each side of the baggie so your kidlets can see the separate colors. Seal the baggie with as little air as possible so your kidlets can mush it all up. *Agitate the baggies so the colors get mixed. *See how there will be patches of yellow melding into the blue making green. Let your wee ones decide how many drops of each color they want. Use poster board or paper to create a graph. Let your wee ones math it out and explore! *Sometimes the colors leak through, if your wee ones freak out wash hands and all will be well. Though blue is harder to get out than yellow! *Mound it up in your hands for shaping fun. Show it off! Take pictures! Document! Go back to the charts and graphs and see what else your wee ones can write down. *Most of all enjoy it and squish squish squish away! 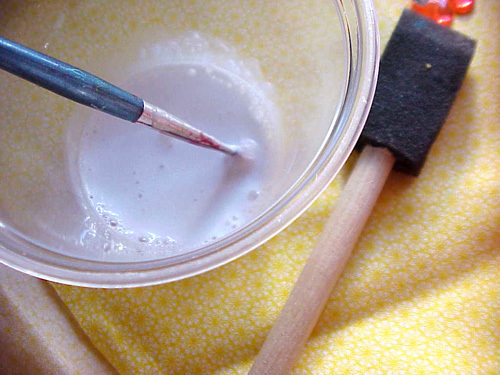 Once the food color is mixed in with the cream it shouldn't stain your wee one's hands or skin. It disolves easily with water and if they choose to make a painting with it the colors from the cream will stain their paper but the cream will eventually disolve. A wee bit o' green fun! Make today a day of green. I'll try to post some pictures later but we're off for a bike ride in 4 minutes so I must type fast! Yikes! Here's a list of green fun you and yer family can try! *Have a green breakfast! Add a drop or two of food color to your kidlet's milk. *Hand your wee one a disposable camera and go on a green scavenger hunt! *Mix green. Give your kidlet's some yellow and blue paint and have them make their own green! Use different shades of blue and yellow and have some white and black out for them also. Expirement and chart their creations! *Collect green paint chips from the paint store and make a collage. Or, gather all the green craft materials you have and create something green! *Serve an all green lunch or dinner. Have the wee ones come up with ideas! *Make green cupcakes! Check out this zucchini cupcake recipe! Most of all have fun! I'll post some pics when I get back! Happy Day! A painting tip. This is probably best for one or two children or maybe the kidlet who prefers to stay free of paint and goo. When I ran a storytime and art program for kids I would sometimes have more than fifty kidlets all clamoring for their supplies. This all taking place in a retail atmosphere I would need to plan it for lickety split clean up and so we used broken down boxes for "tables" and nut cups, dixie cups or cupcake liners for paint and glue. You know the story "If You Give a Mouse a Cookie" Well, that is what I have found with the kidlets. Give them the glue bottle and they use ALL of it. Give them a little cup o' glue and they use all of it and are quite happy with the smaller amount. We also used popsicle sticks and coffee stirrers to spread the glue. Some would use their fingers which was cool also. When your kidlets are young and you need to stay on a budget, dishing out the amount of paint they use will not deter them from their creativity as long as they know they can ask for more. Putting just a little in nifty printed liners makes for such an inviting atmosphere what kidlet (and grownup) wouldn't want to paint? Yesterday was Johnny Appleseed Day and sadly I have no apple-y books on hand (I can't find my copy of Ten Apples Up On Top!) so instead I bring you a nifty list o' fun and a visual guide to apple printing! Gather your supplies. You can do this with any fruit or vegetable of course! now they can stamp their way across the paper! They can also use the fruit as if it were a brush. You never know what thye will do. Just make sure they don't EAT the fruit! 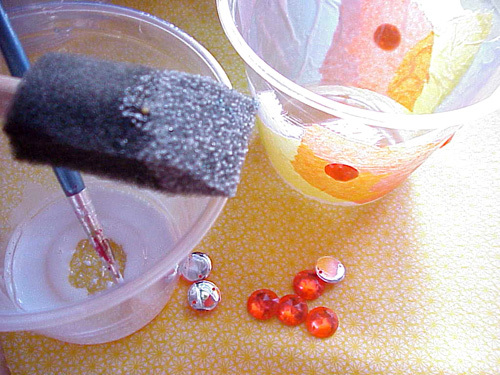 You can add glitter or salt to the paint while it is wet and when it ries it will hold the zing1 Yo ucan also use crayons and/or markers to draw over the painting. Hang it up somewhere special, turn it into gift wrap or cover an old tissue box for fun and purdy storage! Have fun! Here's a nifty and kid friendly applesauce recipe! Adjust it for a smaller batch and give yer kidlets 4 an older plastic knives so they can cut their own apples! Yes but a Chrysanthemum is a different story! I adore this book more than I adore bright yellow mums! This is a perfect story for you to read to the kidlet that dislikes her or his name so much that they wilt. *Have a read through and then talk about how you came to name your wee ones the names you gave them. *Work on some more acrostic poems. *Figure out how many words can be made from the letters of your names. *Get a pack of Mums seeds and plant them with your kidlets. *Get a bunch of Mums from the shop and dissect them. 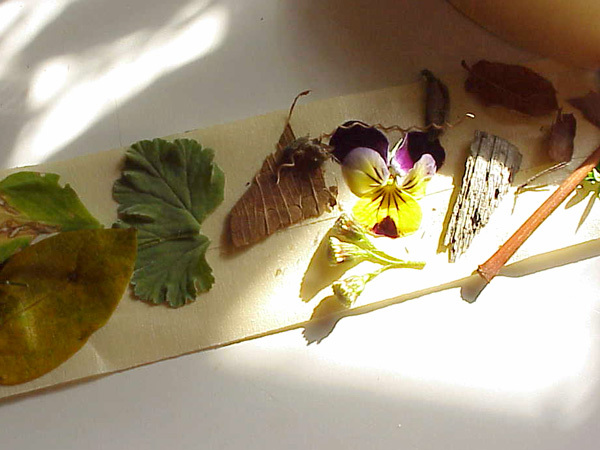 Press their petals or use them as paintbrushes. *Make some chrysanthemum tea or cookies. The yellow & white petals are edible! Another NAME book & some fun! I really adore this book! It has story, style and generations of love and helpfulness. 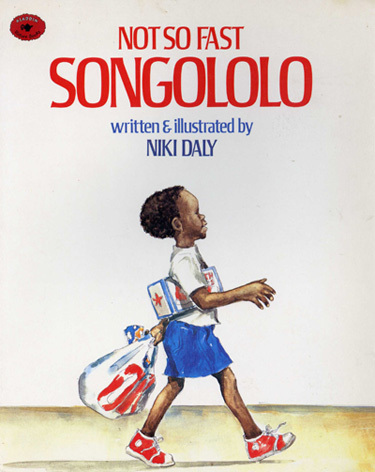 Malusi heads out to the city with his Grandma Gogo. She is a lady who takes things slowly as does Malusi. Together they make a great pair. When Malusi sets his eyes on a pair of red sneakers and Gogo gifts them to him it is all he can do to take is slow with his Gogo. I chose this book for names because it talks about nicknames and the power of love and family. It may be a little long for your young three year olds but I think it is the perfect length for five and six andmaybe even older. Have them read to you! Get out yer kidlets oldest stinkiest pair o' shoes and have them make a walking picture. Spread out large large large sheets of blank paper, giftwrap or an old sheet and secure it with masking tape. 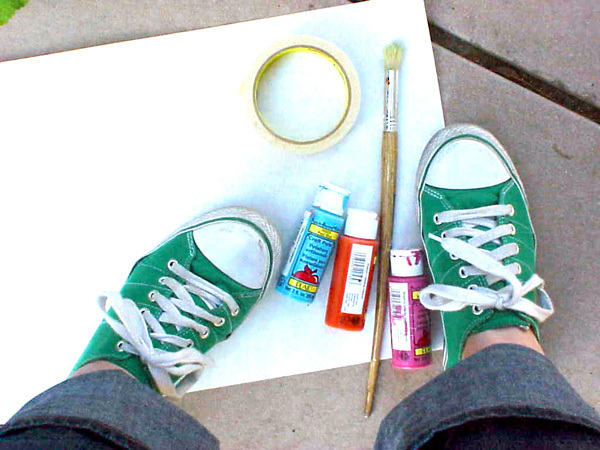 Have your wee ones put on their sneakers and paint the bottom of one shoe with oooey gooey acrylic of biocolor. 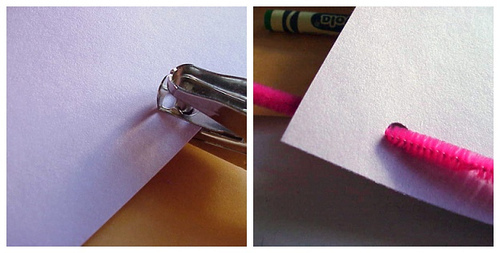 Once done, help them up and have them "walk a picure" on the paper! Let dry and display! You can also give their shoes a good wash and have them paint the entire pair for some fashionable fun later! Take a nature walk if the weather permits. Wrap a piece of 2 inch wide masking tape, sticky side out around yer kidlet's wrist. 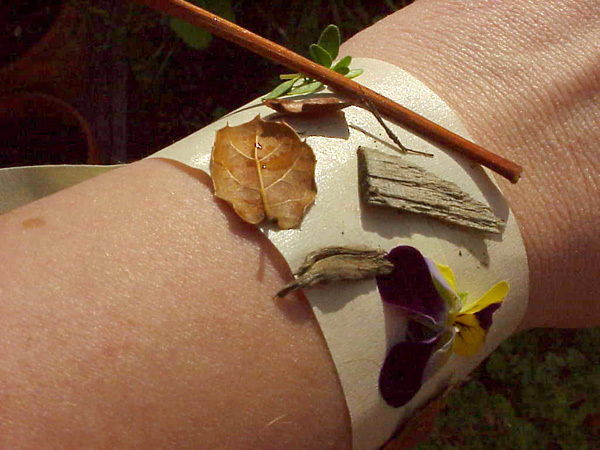 As you walk about your neighborhood have them scavenge bits o' nature to stick on their nature bracelet. Make sure to encourage found nature and not the plucking kind unless it is from your own yard. Once home you can dettach the bracelet, cover with clear packing tape or contact paper, punch a hole at the top, add yarn or ribbon and turn it into a bookmark or window hanging. Really, the possibilities are endless! Ah, books about names. Loving our names, hating our names, long names, short names, you've got it. First up is a favortie favorite by Mem Fox of course with the most whimsical illustrations by Julie Vivas! Published by Omnibus Books (a div of Scolastic) 1984 in Australia & Kane Miller Books 1985 in the U.S.
What a beautiful pairing of characters! The young Wilfrid Grodon McDonald Partridge and the older wiser and slightly forgetful Mis Nancy Alison Delacourt Cooper both share the trait of having four names. when Wilfrid overhears his parents talking about Miss Nancy's memory loss he decides to help her out. Wilfrid asks the other residents of the home what their memories are and puts together a fine collection of memories. What follows is a tear worthy tale of joy, wisdom and loss. If this is a favorite of yours reread it! If you have never read it to your kidlets do so! Your youngs ones will dazzle you with their empathy for Miss Nancy! Set up a staging area and have a show & tell. Your kidlets can draw pictures instead or maybe you all can sit and talk about some favorite memories whenever the chance occurs. Celebrate your name today! There's all kinds of fun kidlets can have with their names! It is one of the first things we learn how to write. When we are just starting out we may not know the whole alphabet in the right order but we sure do know how to spell our names! So, in honor of Celebrate Your Name Day, I offer up to you some links and other fun. Check it out! *Sure it may be a little in the past, but the kidlets won't care when they learn their new Captain Underpants name from Scholastic! Your eight year olds will LOVE this! 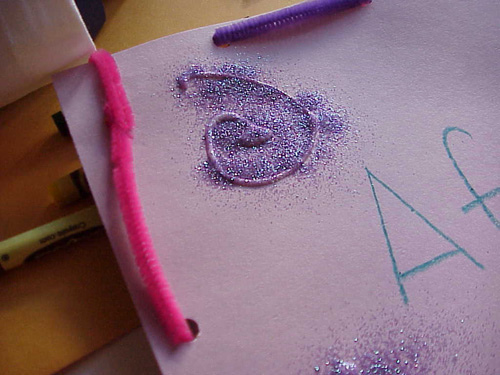 *Teach your wee ones the letters of their names through finger tracing on sandpaper. Write out their names on a piece of sandpaper using a superwaxy crayon and have them use their fingers to trace each letter. The texture of the sandpaper will help with their sensory memory. You can also do this in the sandbox or at the beach! For even more fun textures, try finger writing their names in cornstarch! *Enjoy the wonders of spoonerisms! Spooner-ize yer kidlets name by switching the first letter of their first name with the first letter of their last name and vice versa! Also super fun for school age kidlets! *Older kidlets can create an acrostic poem about themselves using each letter in their first name. *Read yer wee one a story about a character who shares their name. Don't know of any? Ask me, I'll see if I can hunt one down for ya! *Pick up a personalized taggy pillow handmade just for yer wee one! *Start yer wee ones off early with a name puzzle by Melissa & Doug. *Make your home one of emergent literacy and write your kidlets's names everywhere! Or better yet, get yerself a Dymo label maker and go wild! *Have a pirate party and get yer own pirate names! Check back later for some nifty name reads! March 1st is Pig Day! That's me dressed up as Olivia. What a wonderful Pig Day today could be this being the year of the pig and all...I put together two lists for you, one for books and the other for fun so check them out and see if they give you any nifty ideas, I sure hope they do! A long time ago at a pig party I held for Pig Day, I gathered an oddball assortment of all pink craft materials and asked the kidlets to make their own pigs. Now, I know there is no defining rule that says all pigs need to be pink and I told the kids this but just for fun this it what we did. I had just finished taking a children's art class and was overhwelmed with the pyschobabble of it all and decided to revamp my stories and art program to ensure all creations were open ended. I never modeled what the art should look like and I always encouraged creativity. If a kidlet asked for a supply that wasn't out and I had it, I brought it out. This pig party was the first of its kind and I was excited! You should have seen the pigs these kids made! We had fingerpainted pigs, artful pigs, playdough pigs, tissue paper pigs...it was AWESOME! The kids were all having a blast except for a three year old named Joey. He was mighty stressed out and frustrated as he attempted to draw his very first pig. I sat with him and dialogued and offered questions and encouragment and did everything I could to NOT show him how to draw a pig. I was working on fostering his atonomy which for Joey was a big deal because he had an older brother who was just old enough to dazzle him. Through his tears Joey told me he couldn't draw and was not good and I had a sad sad boy on my hands. I brought out all the pig books I read and we talked about how they were alike and different. I brought out a book with photographs of pigs so Joey could see how the illustrations were inspired. After a while he sniffled and was ready to try again. I asked him how many heads does a pig have? Three? Four? Two? Through his giggles he hollered "One!" "Well, there ya go," I said, "What shape is a pigs head?" and slowly but surely he started to draw. You should have seen the twinkle in his eye when he added two dots in a cirlce for the snout and by golly that boy drew the proudest pig of them all and I of course cried like the weepy girl that I am. I was ecstatic. I did it! He did it! We did it! I rode that high for weeks! Joey was so so so proud and excited to show his mom his pig and after that, his little self blossomed. He stepped out of his brother's shadow and created his own little world of wonder. It was always there but he just needed a push. The even cooler part was when his brother got all excited with him! I tell ya, I needed an entire box o' tissues! Yeah, yeah, nice story lady but what does it mean? It means that while it is super easy to model an object or picture for your child, especially when they are pestering you to "draw me a monkey! draw me a monkey!" it is so much more joyful to give them the tools to create their own monkeys, pigs, trains, etc. Take a moment when you have it and sit down with them and talk it out. One thing I do when a child insists I draw or make art with them is I use spots of color and just paint strokes or dots and talk about the colors and what they remind me of. When I play with clay, I roll little balls. I stack them, I count them. All the while I dialogue about the texture, the scent, the colors and how they play into the child's world. You talk enough and soon they will talk with you and start creating their own objects! It is a thrilling experience as I am sure you all know. Check out this nifty dad and his daughter's amazing artwork and see what this mom does with her kids' creations! but it's never too late to brush our teeth!